Come mid-summer, it seems like peaches get all the love when it comes to fruity desserts. But it's unfair to forget about all of the other delicious stone fruits that start popping up at the farmers' market in July and August. 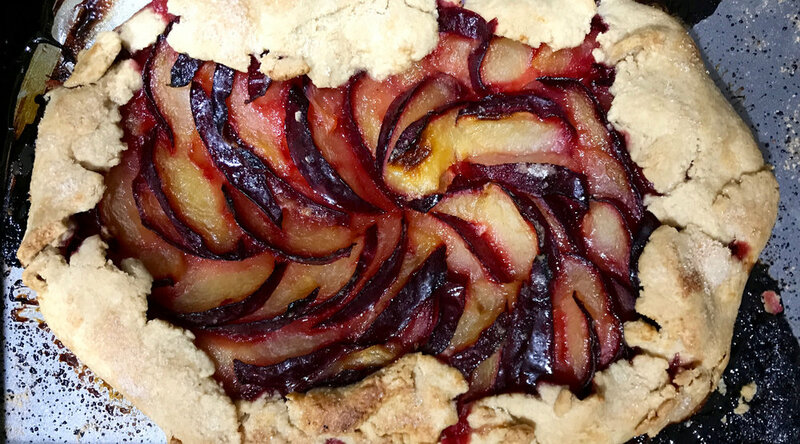 I'm a huge fan of sweet plums - not only are they delicious and juicy, but the contrast of their deep purple skin and bright orange flesh make for an especially beautiful tart or galette. I turned my first batch of plums into a simple and easy galette. Galette's are an excellent summer treat - they come together quickly and use only a few ingredients. And since they don't require a pie pan, they're a great fit for a vacation rental that might not have a fully stocked kitchen. The tart dough comes together quickly, and can be made a day or two in advance if you want to make your evening of baking even more painless. 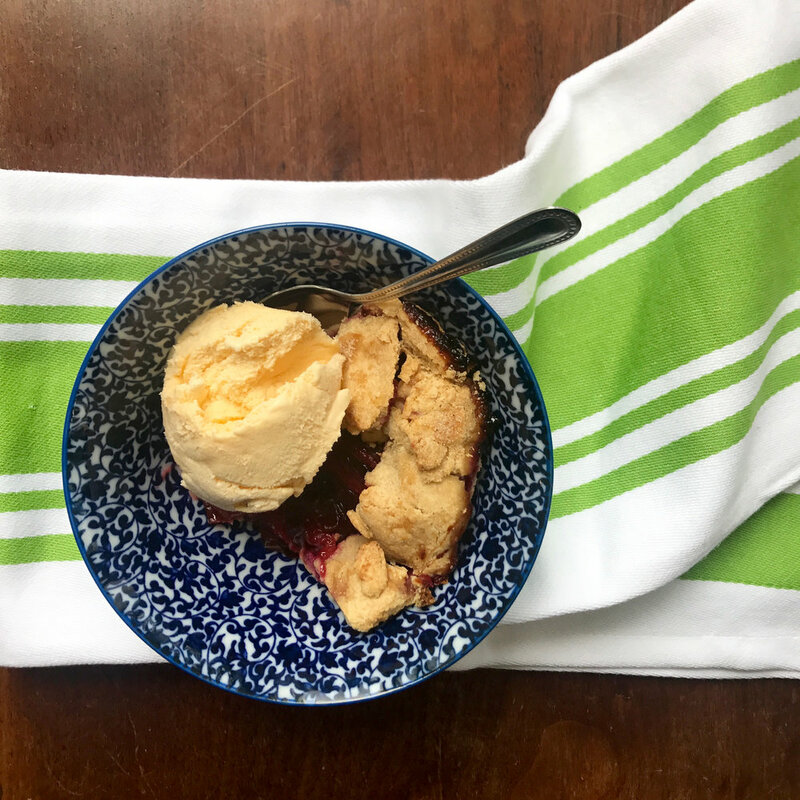 Either way, the result will be a show-stopping, delicious dessert that is deceptively easy and makes the best of summer's stone fruits. To make the crust, mix the flour, sugar, and salt together in a small bowl. Cut the chilled butter into cubes and incorporate it into the flour with a pastry blender or fork until the mixture looks like a coarse meal and the butter has been cut into pea-size bits. Gradually add the ice water until the dough comes together and can be formed into a ball, using as little of the 1/4 cup of water as you can. Wrap the ball of dough in plastic wrap and refrigerate for at least an hour. To make the filling, pit the plums and slice thinly. Combine with 1/3 cup sugar and lemon juice in a medium bowl and toss gently to coat. To assemble the galette, roll the chilled dough out into an oval on a lightly floured surface. It should be about an 1/8 of an inch thick. Transfer the dough to a sheet pan lined with parchment paper. Lay the sugared plum slices out on the dough, starting in the center and moving outward, stopping a couple inches short of the crust's edge. Fold the edge of the crust over the filling and sprinkle the remaining sugar over the crust. Bake in a 400 degree oven for 40-45 minutes, until the crust is golden brown and the filling is nice and bubbly. Newer PostNational Farmers' Market Week!